Boiling liquids, entrained gases, and flashing liquids all affect the behavior of floats in level instrumentation and, therefore, reduce the accuracy of level measurements. 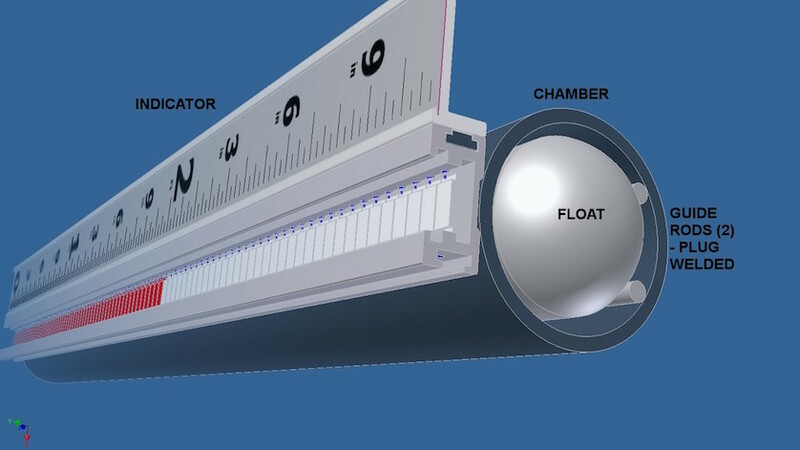 WIKA USA’s level gauge design features an improved solution for internal guide rods that keep the float moving unobstructed inside the pipe. Sometimes liquids inside a level bypass reach boiling points even if the liquid inside the tank does not. For instance, in an anhydrous ammonia application, the boiling point for anhydrous liquid ammonia is −28°F (−33°C). Since a bypass is located outside of a process tank, it is susceptible to ambient temperature changes if not properly insulated. If the air temperature is warmer than the boiling point, the liquid will flash. In standard designs, entrained and flashing gases cannot go around the float. Two things can happen in this scenario: 1) The gases cause the float to sink, or 2) the gases build pressure behind the float, forcing it to the top of the bypass. In either scenario, the level that the instrument displays will not match the actual level inside the tank. Inaccurate measurements caused by entrainment or flashing are particularly problematic for power plant turbines, where low steam levels can affect efficiency and high levels lead to water damage. Facing the same problem are level measuring instruments in preheaters, deaerators, and combined cycle boilers in a variety of industries. What’s needed is a level gauge design that can mitigate these variables. Attaching guide rods to the internal wall of a bypass helps keep the float to one side and near the indicator. This way entrained vapors and flashing gases have room to go around the float and not affect its behavior. However, many manufacturers’ level gauges have internal guide rods that need brackets to stabilize the rod assembly. The problem with brackets is that they can interfere with the float’s travel and cause float hang-ups. In drop-in designs, brackets could actually rotate inside the pipe, which would push the float away from the indicator and render the instrument useless. WIKA’s experts specifically tailor each design that requires guide rods to their respective applications. For the WMI line of magnetic level indicators, the pipe and guide rod diameter are selected based on liquid media properties, ASME design code, design temperature, and pressure. Once positioned, the rods are permanently welded to the pipe. This no-brackets design ensures an uninterrupted travel path for the float while positioning it close to the indicator. WIKA’s innovative level gauge design assures accurate readings and prevents level instrumentation from malfunctioning or becoming inoperable. Our WMI magnetic level indicators with bracket-less guide rods provide reliable measurements to keep your processes efficient and safe. Contact WIKA todayfor more information.